Anyway, a certain amount of time ago, I decided to build a CPH. On-board reservoir, nothing flashy about it, just a standard CPH. For whatever reason, progress stopped and I kept it in my closet for all this time. Now, having been motivated to finish it, I decided to pull it out and see what I could do. I made a very inconvenient mistake in designing the reservoir, now it will have to be tilted vertically when I'm low on water because of where I reduced the pipe diameter. 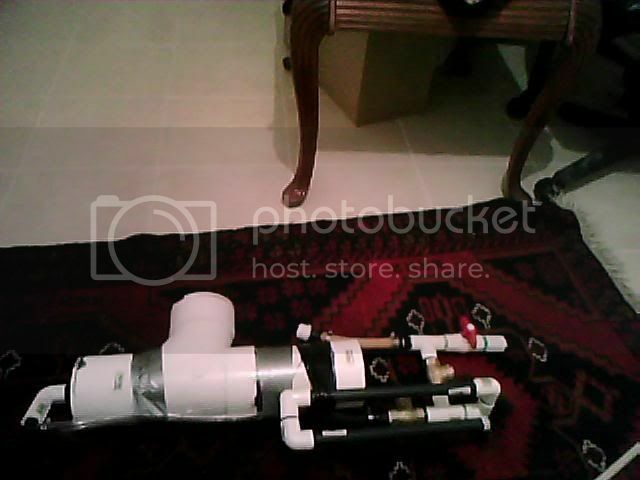 You may notice the obscenely long and curvy pump shaft, that is for ergonomic purposes, otherwise the pump would start a foot in front of the trigger valve. The plan is to make the empty space between the reservoir's tee and the pressure chamber into a PC case, a 3" or 4" pipe, depending on what I have available. A few pieces of wood to stabilize the thing (apparently vinyl tubing can get wobbly) will be added below the PC case, and other than that I had already done most of the work when I originally started this project. Just thought I'd share this potential beast (it's really big. That's 4" PVC in the reservoir to give you an idea of how big it is). Looks good. Nice to see you still around. Work on the pump has begun. No idea how well it will seal, that's easy enough to fix. My question is lubricant related, I don't want to use vaseline and risk the o-rings, so would an oil-free moisturizer be safe to use? I assume it's the oils in vaseline that damage the rubber, so my guess would be yes, but I want to confirm. I can't find my silicone grease, nor do I want to shell out $7 for a new one. Otherwise, nothing new to report, still looking for my LRT. Today I found a bunch of soakers I decapitated, including the EES turbine I tried to turn into a CPS and my WW Lightning's Hydropower PC (will look for something to do with it eventually), but no sign of my LRT. I guess I'll take the time to ask for an opinion. What should I use as my reservoir cap? 1) Endcap with a hole in it. The endcap would be cheapest but is too low end for me and will leak. Check valve would be the most expensive, but is my favourite option because it's the most convenient. The ball valve makes filling easy, but also can leak. Opinions? You could try to make a PC entirely out of inner tubes. That has been done before with mixed results. You also look like you uave enough space to put a sherical balloon PC in. An inner tube colossus is my backup plan, and a spherical PC is my last resort. For the inner tubes- imagine a huge colossus, but without the stock PC in the middle. This is what I mean, it's not really a colossus mod, as your not modding anything, your making it from scratch. I get what you mean, but inner tubes+LRT>just inner tubes. It's easier to work with at any rate. Anyway, I need another trip to a hardware store soon. Whoa, I seem to remember you from three or so years ago. Nice to see some of the old faces back in the game. Anyhoo, the gun looks solid, and the ball valve should be your best bet for the reservoir cap. You may want to stick a small check valve into the reservoir, like Ben did in his THR. IT is especially important in larger reservoirs, as reservoirs are often not pressure rated. I would agree on the ball valve though. 3/4 inch, ideally, though half inch would work. If you used 3/4 inch, you could screw in a hose, quickly filling your reservoir, and then your PC. The check valves in the pump would let the pressure by. Backwards SC homemade! If you couldn't find your LRT, it might be easier to make a inner tube PC to test with until the LRT arrives, or is found. Then you'll have worked out the kinks(no pun intended) before you get the LRT, so you use your time more efficiently. @zeda, thanks. My interest fluctuates, sometimes I get really into it and other times I just remember the hobby fondly, but 'tis the season now. A check valve that you can screw on and off seems good, becausee water bottles won't push water throught the check valve. Alright, I can cross #6 and almost #1 off my list of things to do, I just need to lube the pump. I will soak it tonight and work on it later. Atvan, I'm thinking a big (1 1/2") check valve with a weak spring, anything can push water through those. Basically I want to emulate the fast fill caps on Super Soakers. That would have to be custom made(by you). Not necessarily, I have seen the type of check valves I'm after at the Home Depot. I don't mean exactly like fast-fill caps of course, but something with a similar use. That woule be quite handy.